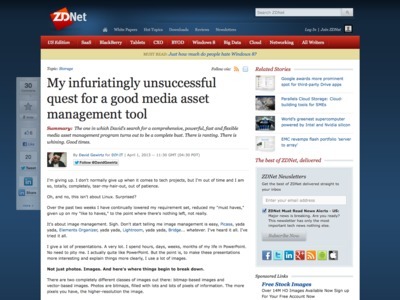 “There is a category called "Digital Asset Management" out there as well. These are enterprise-level products, often Web-based. You can begin to tell they'll be trouble because there's no price for the product on the site. Almost all providers of DAM tools have a "let us have an expert call you" button. […] I'm also disappointed in the Web-based and enterprise-based solutions. First, the barrier of entry is huge. There appears to be a disconnect between the needs of a professional designer with thousands of images and a large corporation buying an enterprise package.